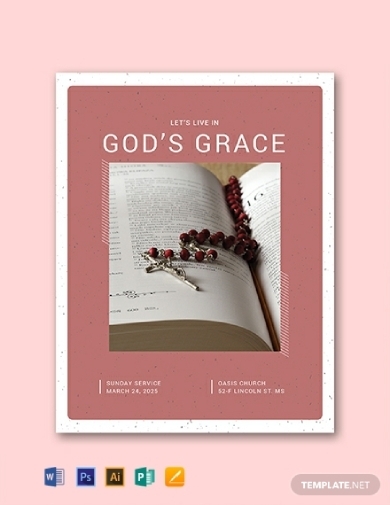 Different congregations have different ways of celebrating or sharing the Word of God; in that sense, they have varying parts on their services or church programs. Having a program customized for the day of the service allows them to incorporate the details and information especially for that day. In this article, various church programs used for different occasions are provided for your perusal. The Catholic Church has a specific way of celebrating a funeral mass service. A Catholic funeral mass, also called a Requiem Mass, is traditionally held at church where the casket or urn is sprinkled with holy water. 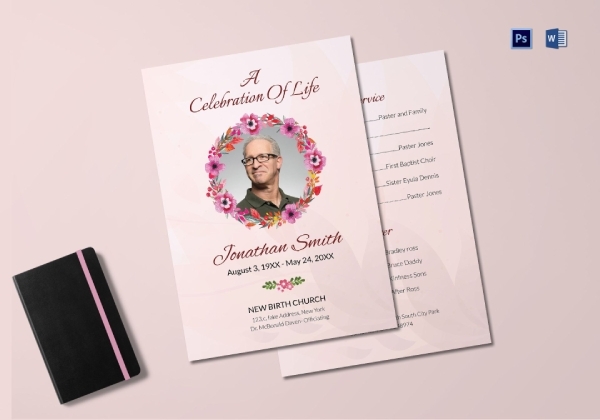 If you want to have a beautifully designed church funeral program, you can download this template. 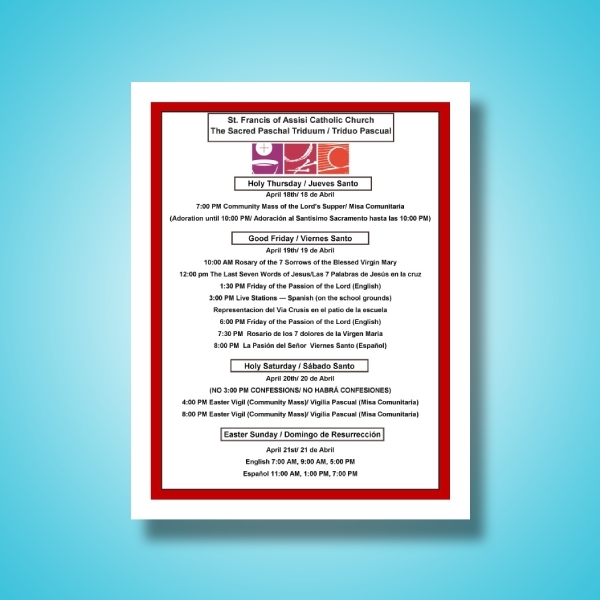 Funeral order of service is basically a funeral program that contains the schedule or parts of the service. It gives the attendees a guide and an overview of how the service will be conducted. Should you need an easily editable template for this, you can download this one and edit its contents in MS Word or Adobe Photoshop. 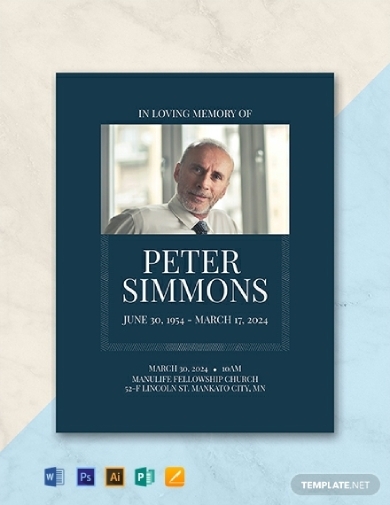 In honor of a departed loved one, it is important to produce a beautiful and high-quality funeral program for his or her funeral service. Using a template to help you out with this will make the process more efficient for you. For that, this template is the best option; you can download this template from this article and edit its contents as you please. 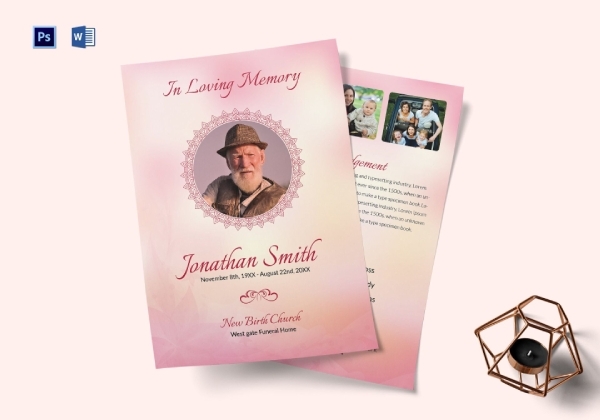 Aside from being a guide, a program can also serve as the official funeral invitation for the funeral service. 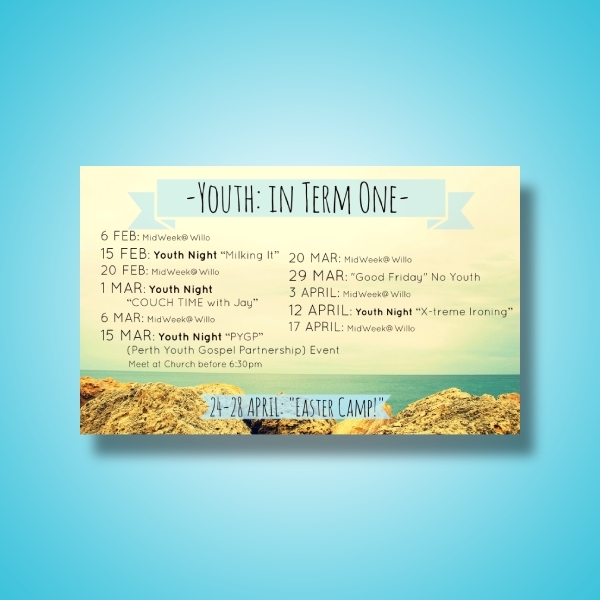 Aside from the parts and schedule of the activities, you can also include the event name, the date, time, location, etc. 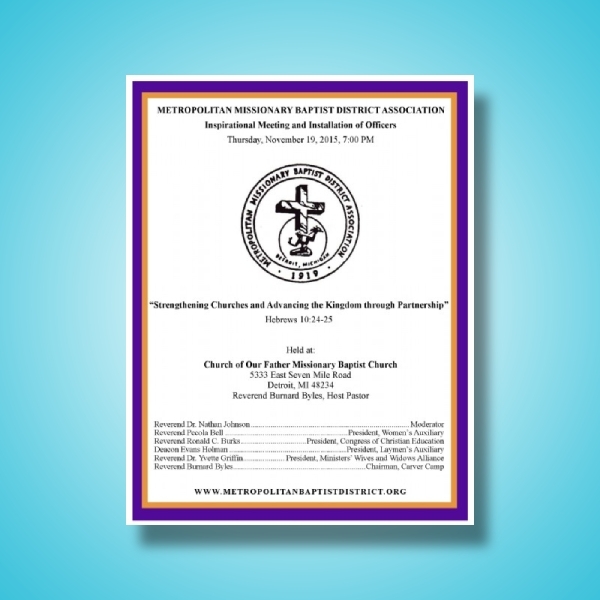 This template is the perfect outline to use if you want to achieve the perfect church funeral program invitation. The main difference between a memorial and a funeral ceremony is that a memorial is held when the remains of the deceased will not be present during the ceremony which is the opposite for a funeral. 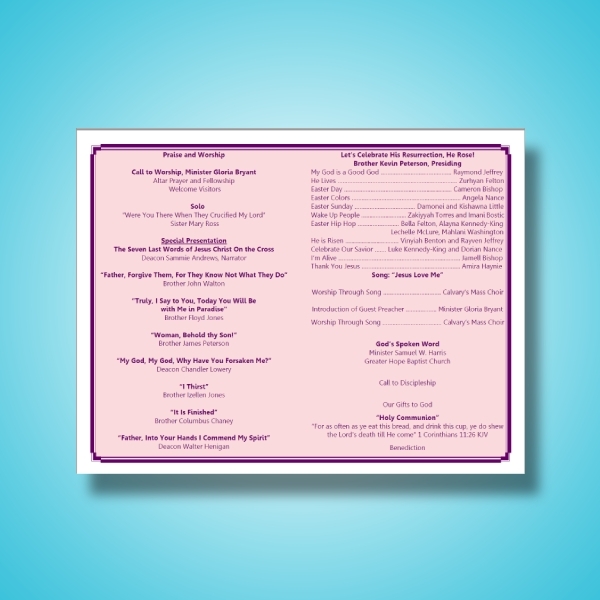 If a memorial ceremony is the best option for your circumstance, you should use an appropriate memorial program just like this template. If you come from a religious family, it is normal that you want to celebrate your wedding in the church that you prefer. 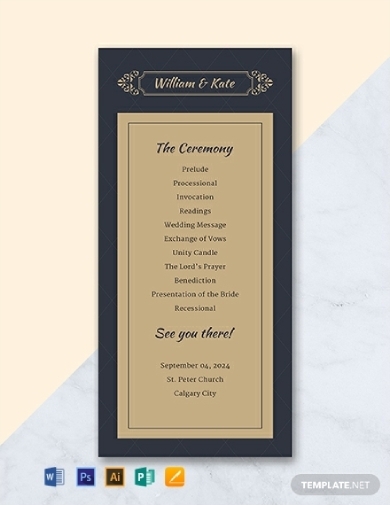 A church wedding program should not be treated differently from that of a garden wedding or beach wedding; its design and layout should still be consistent with the overall wedding theme you have chosen. Marriage is one of the sacred matrimonies in Christian faith; it is the holy union of two people who love and care for each other. 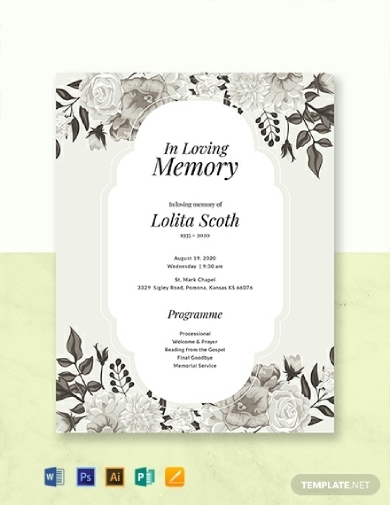 If you plan to have a solemn church wedding, giving a wedding program to your guests will help them know what parts or activities will be conducted within the ceremony. Should you need a high-quality and beautifully made template for this, you can download this editable template for free. Easter Sunday is an important day in the Christian community; it is the culmination of the Lent season wherein Jesus resurrects from the dead. In this regard, churches hold a grand celebration to celebrate the new life and hope brought about by Jesus’s resurrection. 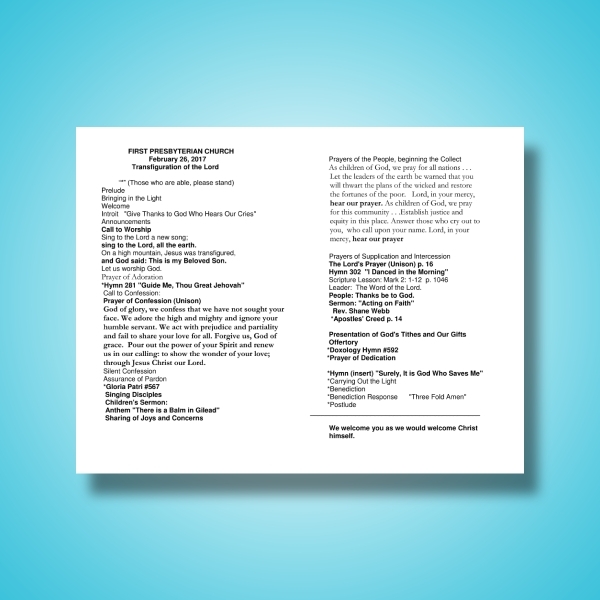 If you are tasked to create the Easter program for your church, you can take inspiration from this program example. Aside from religious events, some churches also make it a point to incorporate significant cultural events that affect their members like in this example. 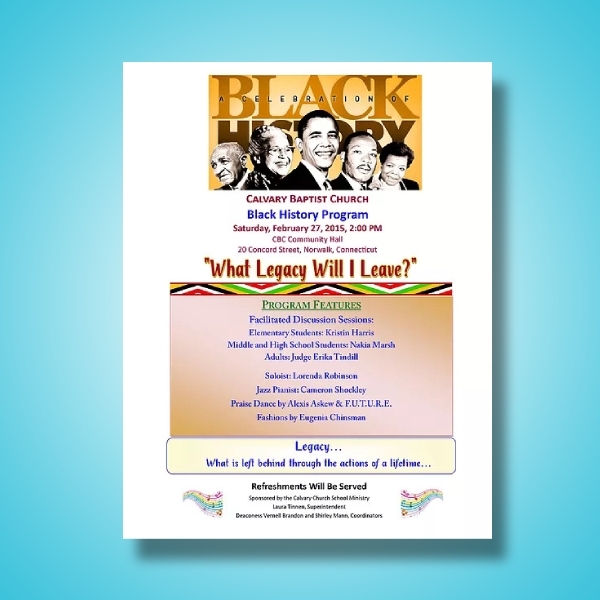 This church program example centers its parts and discussions on the importance and relevance of Black History Month to its members in a way that connects to their religious teachings. Churches also make it a point to encourage the younger generation to lead a life following the teachings of God; hence, they conduct events that focus on the enlightenment and empowerment of the youth. To make sure that the event has a smooth flow, they curate a special program that organizes the activities for the said event similar to this example. As you know, various churches have different ways of celebrating mass; they have different parts or activities that are all required for the said service. In this regard, having a church service program outline will help the attendees know who will be speaking on certain parts, what will the reading be about, what will be discussed, and so on. Schools and universities that are owned by religious congregations always ensure that they celebrate all religious events in the university church. Similar to this example, an Easter celebration will be conducted on the university as an observance of a religious tradition. You can take inspiration with this example if you are tasked to create the program for the Easter and Holy Week celebration. Aside from mass and services, churches also hold meetings with their members as another way of spreading the Word of the Lord through inspirational dialogues. Sometimes, within that meeting, they also officially install officers for the church organization/s. Since that meeting will have a couple of important parts, creating a program that will help present an overview or guide will help attendees know what will happen within the event. 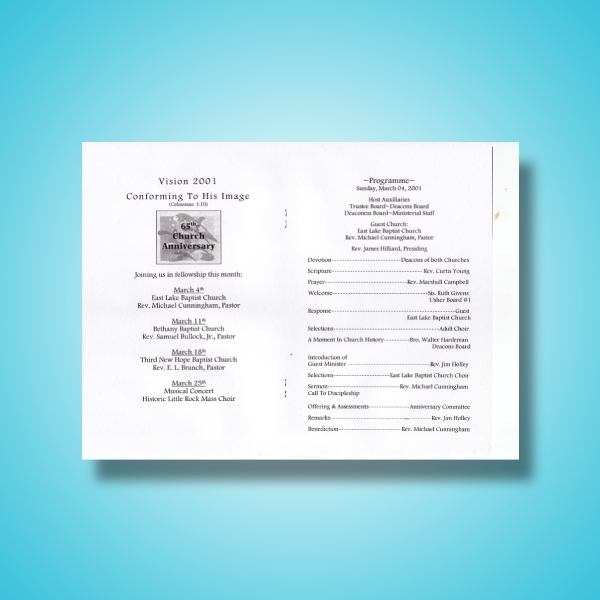 When celebrating a church anniversary, a church anniversary program is essential in ensuring that everyone has a clear idea with the activities included in the celebration. When creating the program, the design and layout should not be the priority, but instead, the sequence of the activities should be given the most important consideration. The Holy Week is in observance to the Lent season that serves as a preparation for the Easter resurrection. Each day of that week has different activities; thus, a program that provides a clear schedule and outline of activities is important so that church members can be guided. 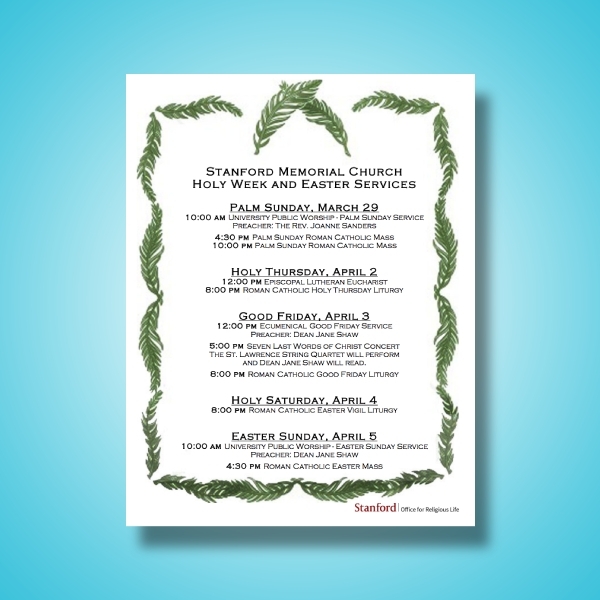 Use this example as your guide and reference when creating your own Holy Week program. 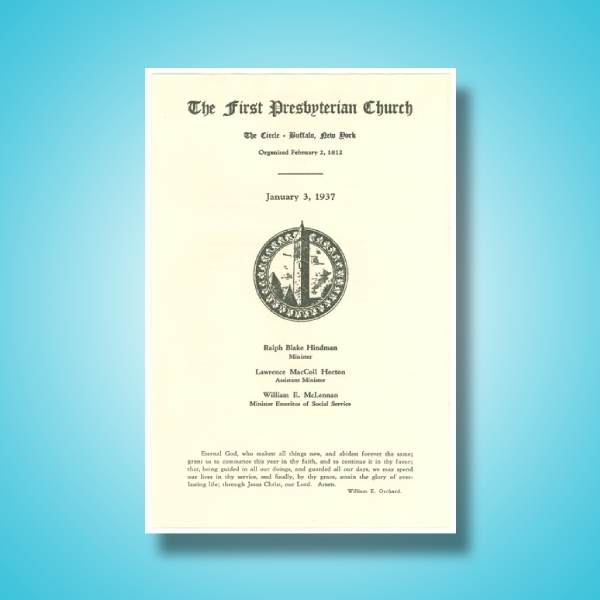 This example is a vintage church service program of the Presbyterian Church. 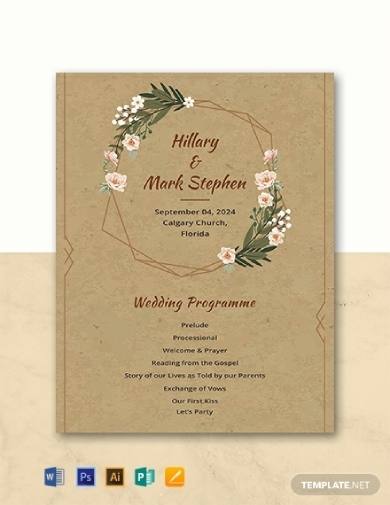 This example has a simple cover design using their church logo as the main element. It has also included the date of the service and the names of the ministers that will be celebrating the service. If you are looking for inspiration with your program cover, this is the perfect example for you to use.